The Washington Post of Monday, April 16, portrays President Trump as surrounded by a traitorous foreign policy team which is lying to him constantly and persistently about Russia and actions this team has taken in the President’s name, in your name, against Russia and China. The Post attempts to claim that Trump’s national security staff staged a palace coup against him concerning Russia and Syria and that Trump lost the battle. But the President responded immediately by acting against the traitors around him. He scuttled the appointment of Nikki Haley’s assistant, the Never-Trumper Jon Lemer, for a national security post with Mike Pence. The White House announced that new sanctions against Russia, based on Russia’s support for Syria, which Nikki Haley promoted only yesterday, were being rolled back. It was publicly announced that President Trump still wants to meet with Vladimir Putin, although a date has not yet been set. At the same time, French President Macron bragged to the world that it was he who duped the President into a missile attack on Syria, reviving the very Clinton/Obama regime change doctrines the American people righteously rejected in the 2016 elections. This only sets the stage for ferocious blowback on the President of France. 1. The Syria chemical attack hoax, the Skripal poisoning hoax in Britain, and the British-inspired coup against our President are all one British strategic package. Britain, with its long-time poodle France in tow, is now out to lead the Western world in challenging Russia and China, who are claimed to be practicing something called “totalitarian capitalism.” Here is how British imperial scribe Allister Heath described the British motive for the poisoning hoaxes in Salisbury and Syria in the March 14 London Sunday Telegraph: “We need a new world order to take on totalitarian capitalists in Russia and China… Such an alliance… would dramatically shift the global balance of power, and allow the liberal democracies finally to fight back. It would endow the world with the sorts of robust institutions that are required to contain Russia and China… Britain needs a new role in the world; building such a network would be our perfect mission.” Across the pond, as they say, a similar foundational statement was made, at the very same time, by 68 former Obama Administration officials who have formed a group called National Security Action, aimed at securing Donald Trump’s impeachment and attacking Russia and China. 3. Already in Great Britain there is an enormous popular reaction against these lies, coming from the Labour Party and the Brexit movement. They appropriately compare the “classified” evidence for the poisoning hoaxes to the lies leading to the disastrous Iraq War. Similarly, here, the forgotten Americans who elected Trump to end this nonsense, joined with LaRouchePAC and protested loudly against the Syria attack all last week. That protest, by all accounts, pulled the world back from the nuclear brinkmanship and posturing fomented by Britain, France, and their Democratic Party and neocon colleagues in the U.S.
4. A major driving force in this situation is the impending financial collapse of the Wall Street and City of London financial centers. Far from practicing “totalitarian capitalism,” China, joined with Russia, is on a massive infrastructure building and economic development project joined by over 100 other nations in the world. It is the largest infrastructure building project ever undertaken by human beings and it has the express aim of ending poverty and raising living standards throughout the planet. China and Russia are also dedicating significant portions of their budgets to space exploration and fundamental scientific discovery. This is the “big thinking” we in the United States used to engage in. It echoes the American system of political economy. “Totalitarian capitalism” it is not. If President Trump accepts China’s invitation to join the United States to the Belt and Road Initiative, the Anglo-Dutch Empire, rather than Donald Trump, will be consigned to the dustbin of history. 5. The situation remains fraught with danger. Nikki Haley and John Bolton have committed the United States to a military response any time a terrorist in Syria can stage another phony chemical attack. Ukraine is another possible trigger point by those engaged in treason against our country and our President. It is also now clear that a desperate Robert Mueller is out to turn Donald Trump’s lawyer into state’s evidence against his client, a tactic the filthy Mueller has repeatedly used. Mueller’s tactic, this time, just may have eliminated the Sixth Amendment to the U.S. Constitution. Mueller is desperate because Russiagate has blown up, Comey is a flop, and whole sections of the Obama Justice Department are now racing to expose one another’s crimes. So, as the fog clears, we find ourselves actually on the edge of victory. The question will be decided by the courage of the people of the United States, in demanding and acting to end the coup, to expose the perfidious British lies, and insisting on getting on with rebuilding the country and the planet. Lyndon LaRouche warned constantly against pragmatism in just this situation. Citing the words of St. Paul, LaRouche reminds us, “For we wrestle not against flesh and blood, but against principalities, against powers, against the rulers of the darkness of this world, against spiritual wickedness in high places.” (Ephesians 6:12). Be a force for the righteous and the good. The President of France foolishly bragged, in a national television interview Sunday, that he, along with British Prime Minister Theresa May, convinced President Trump to reverse his own policy and keep U.S. forces in Syria "for the long term." This outrageous statement means the U.K. and France are demanding, not just another endless Mideast war from the United States, but a steadily escalating confrontation with Russia, and with China. As one of Britain's own former diplomats said in London yesterday, "That way lies madness." Hamlet spoke with scorn of nations waging war over a plot of land too small to hold one of their battles. Here nations are being dragged toward a thermonuclear world war, over events that did not happen. The evidence: The March poisoning, or intoxication with chemicals, of former Russian double-agent Sergei Skripal in Salisbury, England, was furiously blamed on Russia by May's government; but the British fabrications about this event are now collapsing. In a huge confrontation, "Ms. Mayhem" demanded and got expulsions of hundreds of Russian diplomats by the United States and EU countries. But Spiez Laboratory, the Swiss Federal Institute for NBC-Protection, one of the top five chemical weapons laboratories designated by the Organization for Prohibition of Chemical Weapons (OPCW), found that the Skripal father and daughter were poisoned by a non-lethal drug developed in the U.K. and United States for NATO military forces 50 years ago. That explains why they recovered! But it does not explain why samples the British government gave the OPCW, also contained a deadly nerve agent of a type developed in the old Soviet Union — in a concentration which would have killed the Skripals very quickly. London must explain this; and it must answer whether it is pressuring the OPCW not to release the findings of one its five most trusted labs. A Syrian government chemical weapons attack in Douma did not occur, as U.S. Army intelligence veteran and Virginia State Senator Richard Black explained in an April 12 interview which has spread through the Internet. The Damascus scientific laboratory just destroyed by U.S./British/French missiles had been found completely free of chemical weapons activity in OPCW reports one month ago, and again two weeks ago! British Intelligence, Prime Minister May, and Foreign Minister Boris Johnson must explain this. Helga Zepp-LaRouche said today that the U.S. Congress, parliaments in Europe, must demand explanations; world war is potentially at stake. 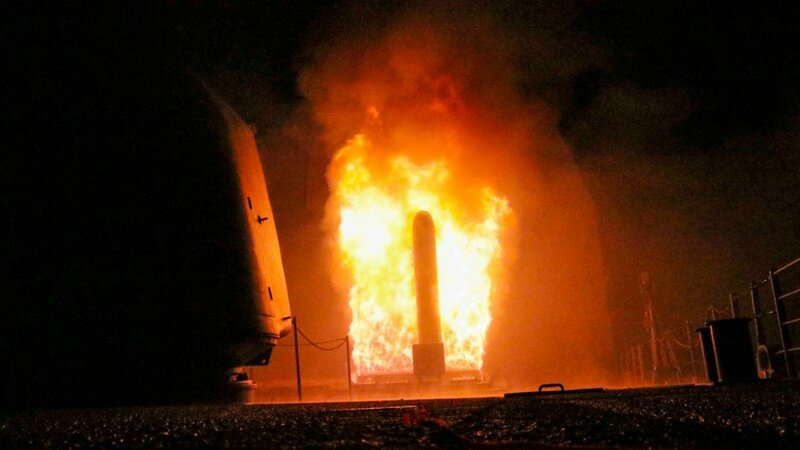 Immediately, the British are giving the jihadis and terrorist groups in Syria the whip hand, to command new cruise missile attacks on Syria by staging "chemical attacks. The "Steele dossier" produced by senior agents of British MI6 Intelligence has been the fraudulent basis for an intense drive to force President Trump to accept British geopolitical policy and confront Putin and China — and then impeach him. These are hoaxes, the kind of lying intelligence by which Tony Blair's British government pushed the United States into the Iraq War, and by which British Intelligence a century ago prepared the way for World War I. May and Macron have overexposed themselves. The United States need not be an eternal sucker which goes to war for British lies. Most American veterans of the Gulf Wars, for example, know or strongly suspect that Trump is being fooled by "false flag" attacks. He is being fooled into war by the same circles that want him impeached. Trump planned to withdraw U.S. forces from Syria; America's economy urgently needs development, new infrastructure, new technologies. And it needs a link to China's Belt and Road Initiative projects, and a link to China's capital. For more on the story, please see, "Clearing the Fog of War: Lies, Damn Lies, Damn British Lies."